Sooner or later, you’re going to be dealing with a rubbish overflow situation. No matter how many times you take out the trash during the week, homes have a way of accumulating stuff throughout the years. As new stuff comes in, old stuff gets put into garage, basement or closet. How close are you to hitting “tilt” when it comes to your stuff? When you’re ready to clear out the clutter you need something bigger than your weekly trash can pick up. You have two options: renting a dumpster or hiring Junk King Portland. Which one is best for you might come down to a matter of how much work you want to do. When you rent a dumpster that container will be dropped off at your property. If it is a big dumpster, then it may go out into the street. The challenge with that is the long trek you might have to take from where your clutter is to the street. That can become a problem especially if you’re moving heavy objects and carry things up from the basement. With junk King Portland on the job, that is never an issue. The two-man crew from Junk King will be doing all the lifting and loading for you. That can make a big difference especially if you want to get rid of heavy things like sofas and other pieces of furniture. 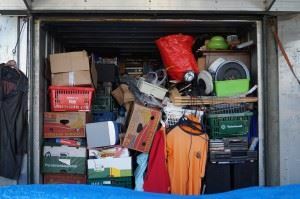 Although you might be able to clear out the clutter into a dumpster in a single afternoon that dumpster probably will have to spend at least one night on your property. Most dumpster rental companies require you to take their units for at least three days. There’s nothing especially wrong with that except for the fact that you may attract all kinds of unwanted trash in your dumpster. Have you ever tossed out trash in a dumpster on your block? Junk King Portland takes care of clutter removal in a single appointment. All they ask is that you set aside a two-hour window for the pickup. Most pickups are accomplished in under 30 minutes. Those two hours allow the crews to travel for one spot to the next. But you’ll always be kept informed about how far out the crews are. When you add it all up, the best way to get rid of your rubbish overflow is to hire Junk King Portland today. This entry was posted in Portland junk removal and tagged dumpster, junk King Portland, Junk removal, rubbish on July 26, 2017 by Junk King. Last updated July 27, 2017 .